CARFAX 1-Owner, Very Nice. Third Row Seat, Nav System, Heated Leather Seats, Entertainment System, Power Liftgate, Rear Air, Back-Up Camera, GT REAR SEAT ENTERTAINMENT SYSTEM, Aluminum Wheels, AWD, Great Color, Local Trade SEE MORE! Leather Seats, Third Row Seat, Back-Up Camera, AWD, Power Liftgate, Rear Air, Heated Driver Seat, iPod/MP3 Input, Bluetooth, Aluminum Wheels, Keyless Start, Dual Zone A/C, Cross-Traffic Alert, Blind Spot Monitor, Heated Leather Seats Rear Spoiler, MP3 Player, Privacy Glass, Keyless Entry, Remote Trunk Release. GT REAR SEAT ENTERTAINMENT SYSTEM Bose Centerpoint w/11 speakers, SiriusXM Satellite Radio, 4-month subscription, Recreational Accessory Package, Roof Rack w/Roof Rails, Cargo Netting, Rear Bumper Guard, 115 Volt Outlet, Navigation System w/Real Time Traffic, 9" DVD Player. 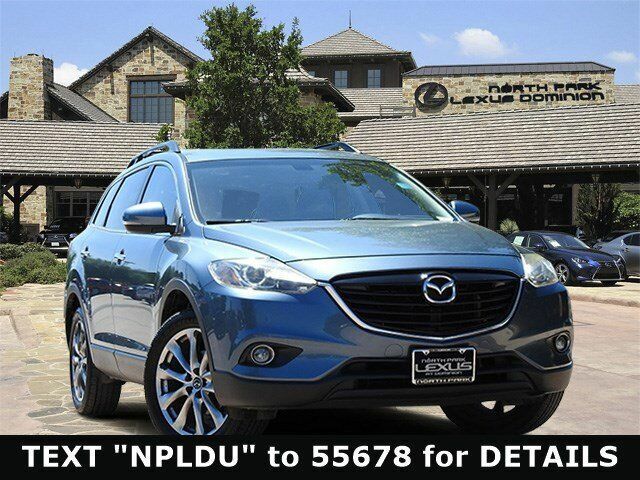 Mazda CX-9 Grand Touring with Blue Reflex Mica exterior and Black interior features a V6 Cylinder Engine with 273 HP at 6250 RPM*. Great Color, Local Trade.